This week Kodak announced that they would no longer be manufacturing Kodachrome film. Even someone like myself who has little interest in taking photos (though always interest in looking at them), feels a degree of sadnes at this news, which is all the more acute on looking at Margaret Strickland’s pictures, taken by her grandfather during the Korean war, and in Valdosta, Georgia (which I found via the excellent new Oxford American art blog). It is, of course, quite typical, that the one picture of hers that I was able to paste in is the least colour saturated. You’ll need to go the immense trouble of clicking to see what I mean. 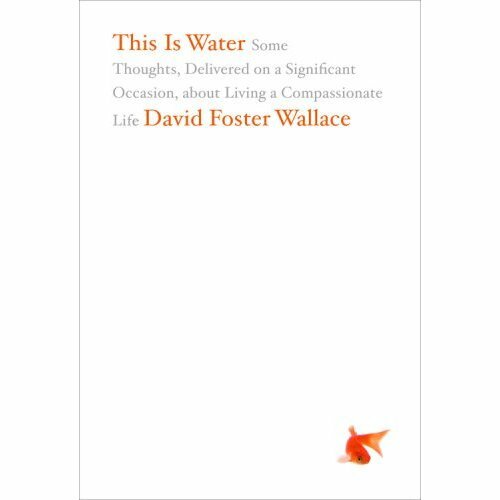 The New York Observer reports that there are two biographies of David Foster Wallace being offered to publishers. One is by D.T. Max (who wrote the excellent New Yorker piece) and has already sold. The other, by David Lipsky, is perhaps not quite a biography, apparently more a sketch based on a series of interviews he did for Rolling Stone in the mid-90s (which never got published). Max’s biography is due to come out no earlier than 2011. He aims to examine the sociological factors that shaped D.F.W’s writing (this for some reason depresses me). Much as I admired Max’s piece, I would prefer to hear more from D.F.W., rather than someone else’s take on him. Let’s hope the Lipsky book finds a home. 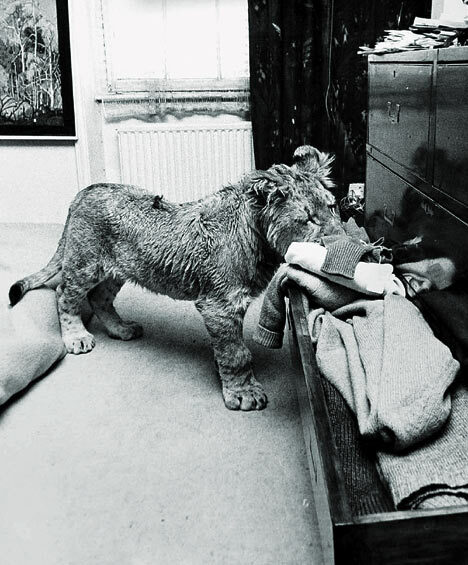 This lion was bought (as a cub) from Harrods, then lived in a London flat in the Sixties. 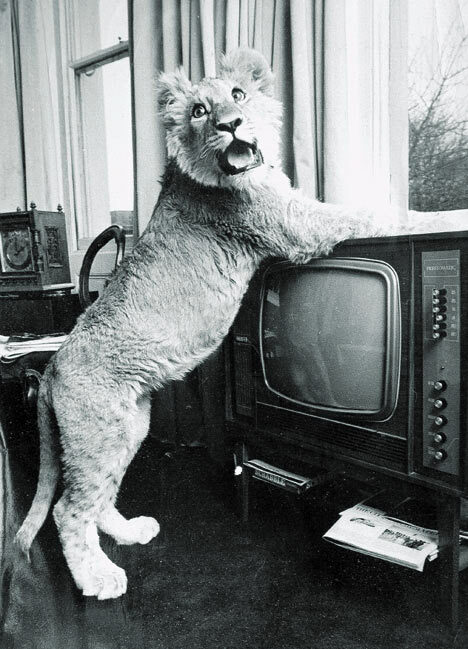 Eventually its owners had him released in Africa, and were then, even more improbably, reunited with him years later. If this all seems horribly cute, I’m sorry, it is Friday. Further details here. Also, here is the sickeningly happy video when they are all reunited. Consider this your advance warning. From September, I shall be doing a PhD on Thomas Pynchon at the University of Edinburgh. Some, or even much of it, may take place in this column. Look forward to half-baked statements, scraps of literary theory, tedious unpickings of sentences, obscure allusions, deployment of dodgy terminology, some of it made-up (for example, yesterday, whilst semi-drunk, I hatched the phrases ‘bathetic inversion’ and ‘bathetic mimesis’). My ‘proposal’ follows below. It is what I think I will be doing, until I start doing it. Then, after an indeterminate period- months, years -I will have a moment of panicked horror when I realise I have been doing something completely different, most likely very far from Pynchon. It will be like wandering in an unfamiliar city where every scrap of wall and face seems delightful till you realise that night is close and you are lost and a figure is coming towards you. As a symbolic structure, the historical novel does not reproduce the events it describes; it tells us in what direction to think about the events (White:1978 cited in Huthceon:1988). The novels of Thomas Pynchon are dense, encyclopedic narratives, rich in allusion and context. Most, if not all, can be considered ‘historical’, in the sense that the majority of their action takes place in the past, ranging from the mid-18th Century setting of Mason & Dixon, up to a period that resembles (whilst not quite being) the 1980s of Vineland. 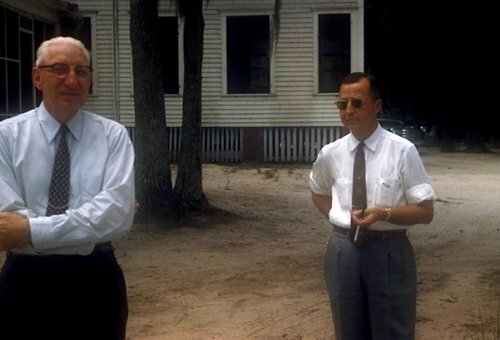 As many have argued, most recently Smith (2005) and Thomas (2007), Pynchon uses these different historical contexts as a way of challenging received interpretations of history, so as to shift the focus from a unitary, cohesive narrative of progress, to one that emphasises plurality, injustice, and the structures of authority (including those of ‘narrative’ and ‘historiography’) that promote inequality. 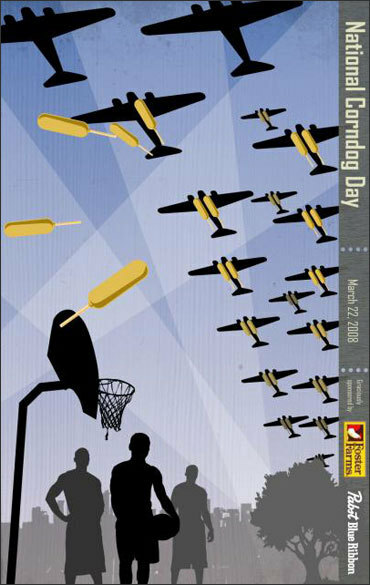 My proposed course of research is to analyse the means by which this project is continued, and extended, in Pynchon’s most recent novel Against the Day (2006), with the aim of understanding its significance in the context of his previous work. The novel’s framing narrative is the Boys-Own style adventures of ‘The Chums of Chance’, which span the chronology of the book, from the late 19th Century to the start of the First World War. These ‘Chums’ travel round the world in hot air balloons, at the behest of semi-mysterious figures, accompanied by a dog with a penchant for the novels of Henry James. This comic pastiche is another example of Pynchon’s ‘serious unseriousness’ (Tanner: 2000). As in V. and Mason & Dixon, the presence of absurd elements (songs, fantastical creatures, elements from popular culture) is used to satirise the naïvete and self-delusion of many of those involved in the business of Empire (and indeed, many of the ‘Chums’, by the end of the book, do question their service of the imperial powers). However, it seems likely that Pynchon’s intends to do more than simply undermine the rhetoric of imperial duty. The notion of an air-borne set of global agents is strongly reminiscent of the science fiction writing of the period (Jules Verne, H.G. Wells et al). By merging this fantastical strand with well-documented historical events, Pynchon (as in his previous work) calls into question the veracity of all presented historical events. This, of course, is what we would expect from any self-respecting (and self-regarding) piece of historiographic metafiction (Hutcheon:1988). Pynchon’s specific purpose may be to interrogate these visions of technological progress, in particular the arguments that such technical advancements would be socially beneficial (see Lindqvist: 2001). In his previous novels, most notably in Gravity’s Rainbow, scientific and technological ‘progress’ has been closely equated with dehumanisation and destruction (Smith: 2005). There are also a number of scenes in the novel where the future literally encroaches on the present, in the form of ghosts from the approaching First World War, and of “Trespassers” from “the end of the capitalistic experiment” (Against the Day: 467). One potential course of inquiry is thus to examine how Pynchon, by embedding ‘science fiction’ within received history, undermines our narratives not only of the past, but of the future as well. My discussion of Pynchon’s use of genre-elements is likely to be informed not only with reference to his previous work, but also by his forthcoming novel, Inherent Vice (2009), which promises to be “part-noir, part-psychedelic romp”. As in many of Pynchon’s previous works, Against the Day utilises recurring symbolic tropes (Smith: 2005). Whilst it will require close reading to unpick these elements in Against the Day, a first reading of the novel suggests that light— its refraction, reflection, its ordering and disruption —is a leitmotif throughout the novel, perhaps representing some of the different uses to which versions of the past, or visions of the future, may be employed by those who possess (or lack) power. In terms of methodology, my approach will be to try and embed the kind of micro-textual analysis performed by Thomas (2007) within the type of framework Smith (2005) utilises. Whilst both approaches have much to recommend them (Thomas’s focus at the level of the sentence; Smith’s sense of the novels’ grand thematic arcs), singly they possesses methodological weaknesses: on occasion, Thomas is forced to rely on rhetoric to bridge the logical gaps in his arguments for the great significance of a single phrase; whilst Smith sometimes try to second-guess Pynchon’s intentions without anchoring such supposition in the text . By combining these two approaches, I hope to complement their respective strengths whilst balancing their shortcomings. In order to provide a theoretical context for my analysis, my research will also include a discussion of the debates regarding the value of metafictional historiography, such as whether or not, in a form so imbued with irony, one can determine the “boundary between parody and mimetic representation” (Witzling: 2007). Or, to put it more crudely, How can one be sure of the political stance of any given text?, assuming as White (1978) perhaps does, that a (postmodern) text can have anything so coherent and knowable. Hutcheon, L. (1988) A Poetics of Postmodernism, Routledge: London. Lindqvist, S. (2001) A History of Bombing, Granta: London. Pynchon, T. (2006) Against the Day, Vintage: London. Smith, S. (2005) Pynchon and History, Routledge: London. Tanner, T. (2000) The American Mystery: Essays on American Literature from Emerson to DeLillo, Cambridge University Press: Cambridge. Witzling, D. (2007) Everybody’s America: Thomas Pynchon, Race, and the Cultures of Postmodernism, Routledge: London. Well, it’s not quite a full trailer, and not great quality. But it gives an encouraging glimpse of how Jon Krasinski has tried to translate DFW’s monologues into film. Somehow, without quite meaning to, I have been leaving my room. Last night I went to a poetry reading by John Burnside and Linda Gregerson, both of whom, despite my misgivings about readings, spoke (and read) very well. Many of her poems had that longed-for (though not predictable) shift in tone or subject that, when it works, is like the shift from cold to warm when stood beneath a shower. 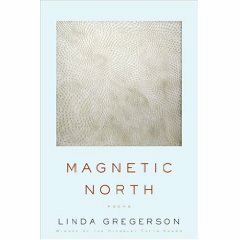 Her most recent collection is Magnetic North. 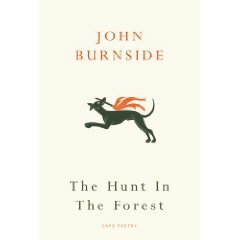 I only know Burnside’s work through his considerable reputation, as both a novelist and poet. The poems he read (including a long narrative poem about hunting a deer that made me recall, in a pleasurable fashion, Faulkner’s story ‘The Bear’) were mostly from his forthcoming collection, The Hunt in the Forest. In all of them the language seemed vital, rooted in landscape and its traditions (not least those of how we represent and imagine it). 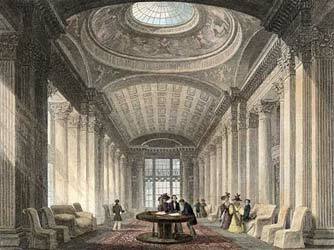 Were this not enough, I also attended the launch of the Edinburgh International Book Festival this morning, held amidst the grandiosity of the Signet Library. 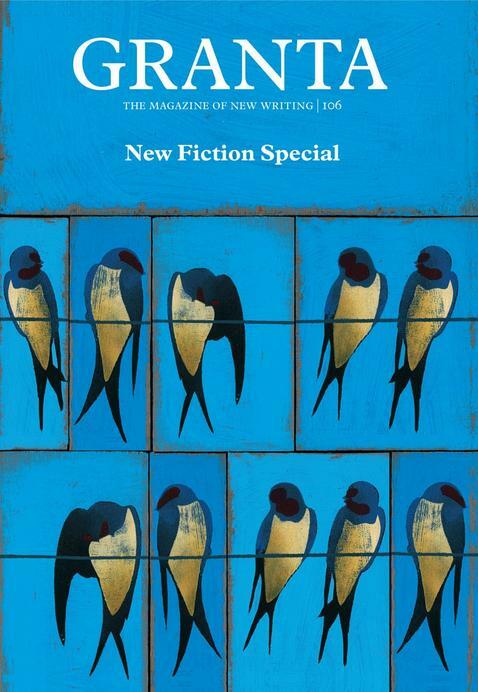 Issue 107 also promises to be good, with pieces by Kenzaburo Oe and (gasp) William T. Vollmann. Now it is the afternoon; the fizz has consented to fade. It was very nice to go out. Shall try it again next year.